In this article, A Shade Above Window Fashions—located in Charlotte and Cornelius, North Carolina (NC)—are going to tell you about why roman shades from Hunter Douglas will revolutionize your windows. 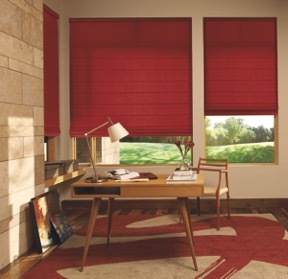 We also carry the full selection of Hunter Douglas blinds, shades, shutter, and motorized window fashions. Crafted in three styles that feature the soft look of fabric folds with the convenience and ease of a shade, the Hunter Douglas Roman Shades Collection will bring your windows to life and bring style to any living space. Read on to discover your perfect Roman shade and be sure to visit or contact A Shade Above Window Fashions to learn more or purchase your own! Clean, crisp, and designed with no exposed cords for safety, Vignette Modern Roman Shades are perfect for a home that prefers an alternative to the traditional Roman Shade while accommodating the needs of pets or children. These custom shades can be created in semi-sheer, light-filtering, or room darkening fabrics that range from solid to patterned, and come in a variety of fold sizes and styles. With such an assortment of options available, these custom Roman shades will look great in any home and for any style. This sculptural shade presents a unique fluid look combining the soft folds of a typical Roman shade with the design of a cellular shade. Solera custom shades are crafted with luxurious woven and non-woven fabrics and come in a variety of colors, textures, and patterns. In addition, Solera comes in both light-filtering and room-darkening opacities in each fabric. Moreover, these beautiful shades, with their cellular design, allows your windows to retain more heat in the winter and expel heat in the summer, causing less energy use and lower energy bills. No matter your style or need, Solera has you covered. With internal lift cords, Solera provides a clean look for your living space while removing any possible hazards for pets and children. Design Studio Roman Shades come in over 250 classic fabrics that will bring life and pizazz to any room. From textures to stripes and prints to solids, and fabrics ranging from cottons, silks, linens and synthetics, there is no going wrong when it comes to styling with these custom shades. Want more options? No problem. Design Studio Roman Shades comes in four styles that include batten front, batten back, flat and hobble. To make your life even better, these shades can also be paired with the PowerView Motorization System, which allows you to lift and close your shades on a scheduled basis, without ever having to lift a finger. With all of the options and styles available, there is no going wrong when it comes to Hunter Douglas Roman Shades. Whether you want to be bold or prefer a clean look, these customs shades are sure to revolutionize your windows. Ready to take the next step or learn more? Contact A Shade Above today for an appointment, and let’s get started! A Shade Above is located in Charlotte and Cornelius, North Carolina, and proudly serves the greater Charlotte area.